Interested in learning more about your city’s history? Join Beatley Central Library and Senior Services of Alexandria (SSA) as we tour Old Town and visit some of its most valuable landmarks. Tours take place on the 2nd Friday of every month. They are free, but space is limited. Unlike other tours, which typically meet at Beatley Library beforehand, please meet at Ft. Ward Park at 10:00am for the hour and a half tour. The address is 4301 W. Braddock Road. 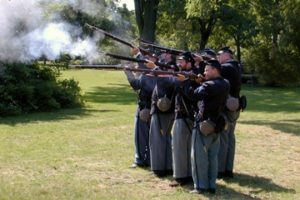 Fort Ward Museum interprets the site’s history and offers exhibits on Civil War topics, education and interpretive programs, tours, lecture and video series, bus tours, and living history activities throughout the year. The Museum and Historic Site also interpret Alexandria, Virginia as an occupied city, the city’s role as a vital Union Army crossroads, life within the Defenses of Washington, and the everyday life of Civil War soldiers and civilians. The historic fort provides visitors with an excellent understanding of Civil War-era military engineering. About 90% of the fort’s earthwork walls are preserved and the Northwest Bastion has been restored and reconstructed to its original condition.